The most popular route is Stockholm to Riga. The average price this month for this route is £123.50 for a car and two people each way. Booking a ferry to Latvia is simple, easy and safe with AFerry, just use the booking form above to get a price. Booking a ferry to or from Latvia couldn't be easier with AFerry. You can either use the booking form at the top left of the page. Latvia is a relatively small European country, approximately one third the size of the UK. It borders Estonia to the north, Lithuania and Belarus to the south, and Russia to its east. The currency is the Latvia Lat (LVL), and Latvia is well known for being an interesting and historic country with an impressive array of sights and events. 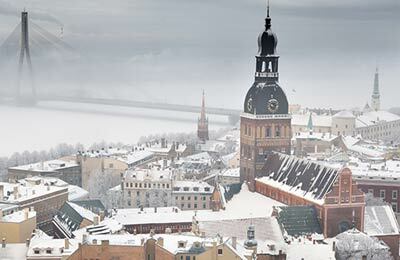 Latvia is an incredible place and why it is becoming one of the most popular areas of Europe. With impressive castle ruins, golden beaches and a great range of shops and restaurants, Latvia is definitely somewhere to explore. Latvia is known for its many forests that cover almost half of the country and where you can find a huge variety of local wildlife. In eastern Latvia, you will find vast lakes and deep river valleys. Throughout the country, you will find an abundance of beautiful rivers, the largest being the Daugava. The best time to go is from June to mid-September, in the Latvian summertime, when the weather is warm and the best local produce is available. During October and November, there are very little hours of daylight, and January and February are typically the coldest months. When taking your car across to Latvia, remember to make sure you use winter tyres between December and March, as the roads can get very icy, and remember to use your headlights at all times during this time of the year as it required by law. The motorways in Latvia are generally of very good quality, and in all major cities there will be a car or motorcycle hiring outlet. Within cities such as Riga and Liepaja there are some excellent bus, tram and trolleybus services. The capital city of Riga is the largest city in Latvia, and one of the most popular too. 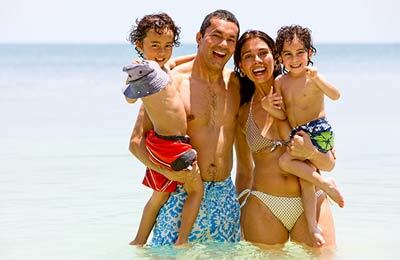 It is surrounded by its impressive 800 year history with many beautiful buildings and monuments. 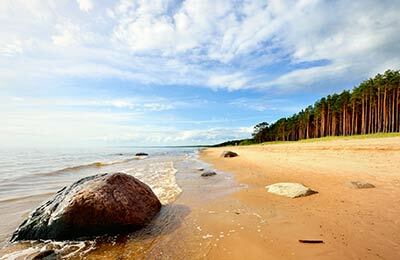 Karosta, home to the `Baltic Beach Party' in July, is Latvia's major seaside town, with a lovely sandy beach to relax on in the summer. The capital city of Riga is the largest city in Latvia, and one of the most popular too. It is surrounded by its impressive 800 year history with many beautiful buildings and monuments. However, if you like history, then Sigulda is the place to go. You can marvel at the beautiful castles and take in the history of ancient Latvia. Nearby is the town of Cesis, where you can take a direct bus to from Riga, where you will be surrounded by windswept hilltops and traditional cobbled streets in one of the prettiest parts of Latvia.